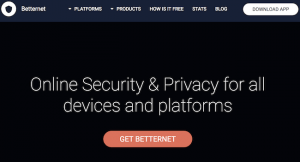 Is Betternet a trustworthy and safe VPN service? Extensive testing and research for this Betternet VPN review suggests the answer to that question is NO. As you will see below, I uncovered the following issues with Betternet VPN: embedded malware, tracking libraries, IP address leaks, DNS leaks, poor speeds, and poor reliability. Perhaps most concerning is the fact that Betternet has been caught embedding malware and tracking libraries into their VPN apps, while promising to protect the privacy and security of its users (we’ll cover this in detail below). Betternet is yet another example illustrating the dangers of using a free VPN service. Update: In addition to all the issues identified in this review, Betternet was recently found to have been hacked. It was one of eight Google Chrome extensions that were hacked and used to spread malicious advertisements. 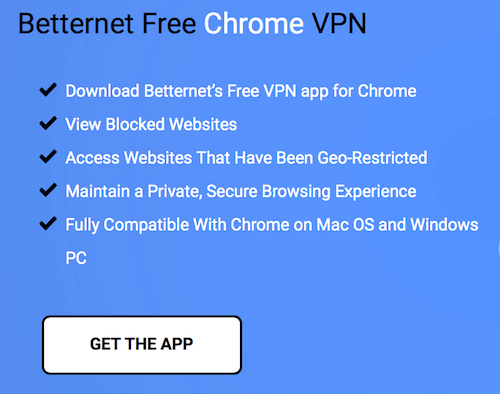 Free VPN Proxy by Betternet – DANGER! A team of academic researchers studying VPNs identified Betternet as one of the most malware-infested VPN apps in the Google Play Store. They found that Betternet tested positive for malware by 13 different antivirus programs. This gave it an AV-rank of 13. Despite millions of installs and a good (4.3) rating, Betternet has a very high malware presence according to this research. This is why you can’t trust most ratings when looking for a good VPN service. 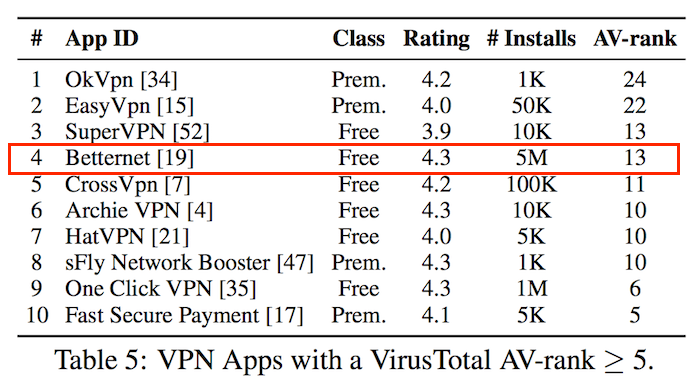 When you use a free VPN, you are most likely the product. Also in their terms, they claim to “secure your internet session.” But in the very same sentence they tell you that they don’t protect your device from “malware, trojans or viruses” – and then in the next sentence recommend “anti-virus solutions” for their users. The same study from above also identified a high presence of third-party tracking libraries in Betternet’s Android app. Out of the applications studied, Betternet was found to have 14 tracking libraries in their Android app alone. These tracking libraries may be used for “analytics, tracking, or advertising purposes” and are embedded into the source code of the app. 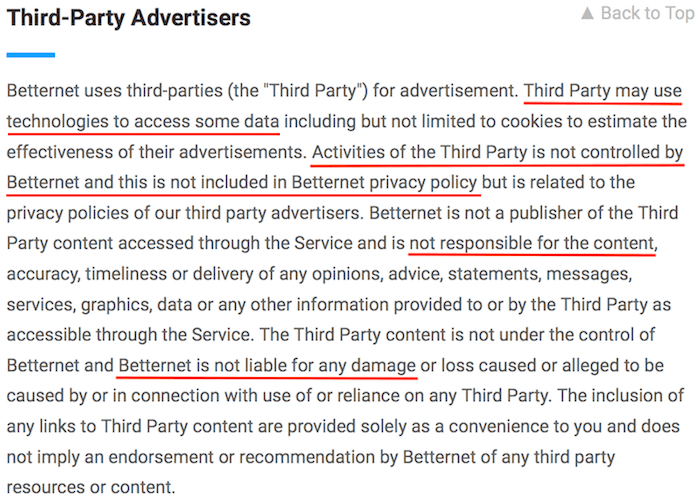 So Betternet is giving third parties access to user data for the purposes of “advertisement”. Why is there malware and tracking embedded in Betternet’s applications? The short answer is this: your data is valuable. Malware and tracking are simply tools to collect your data, which is one way to monetize “free VPN” applications. After collection, your data can then be sold to third parties (a very large and profitable industry) or used to hit you with targeted advertisements (which brings in commissions on sales). In essence, when you use a cheap or free VPN, you are the product. It is your data that is being collected, which is then used to monetize the free software. Note: this is the basic business model of most “free” online apps – from Google products to “free” VPN services. The results: Betternet leaks both IPv4 and IPv6 addresses. In the screenshot above you can see that Betternet is connected and in the background (on the left) is the IPv4 leak result. This test was performed using Betternet for Windows. Repeating the tests again with the Perfect Privacy IP checks tool, you can see there’s an IPv6 leak while the Betternet VPN Windows client is connected on the right. Is your privacy protected when Betternet is leaking your IPv6 address out of the VPN tunnel? Nope. Do not use a free VPN if you care about your privacy. A DNS leak occurs when DNS requests leak out of the VPN tunnel. This exposes your browsing history as well as your internet service provider’s IP address, which reveals your general location. Unfortunately, every Betternet server I tested was found to have DNS leaks. Here is one result when connected to a Betternet server in the United States. Betternet’s VPN was also tested for speed, using the website speedof.me. My physical location was Germany. As you can see, these speed tests results were not good. If you need a VPN for streaming media, this won’t be sufficient (based on the results above). In testing out Betternet for this review, I found it to have some problems with reliability. My VPN connection would frequently drop. Because Betternet does not provide any leak protection with their software, this meant that my IP address was exposed during every dropped connection. Most of the testing for this review was on the Betternet for Windows application. While many people seem to use Betternet on mobile devices, the Betternet Windows app seems popular. Windows is definitely known for privacy and security problems, especially Windows 10. Unfortunately installing Betternet on your computer will not protect you, based on these results. I used Betternet with Windows 7 for the tests above. And as you already saw, the results were very bad. Conclusion on Betternet with Windows: not recommended. Betternet also offers a Chrome extension that appears to be quite popular. I installed the Betternet Chrome browser extension and tried it out to compare it to the Windows app. Unfortunately the results were the same: many leaks. The Betternet extension for Chrome also had problems with IP leaks, DNS leaks, as well as speed and overall performance. Betternet for Chrome: equally disappointing. Conclusion on Betternet with Chrome: not recommended. Betternet is a product of BetterNet LLC Inc., which is based in Canada (a Five Eyes surveillance country). Note: You don’t need a Canadian VPN service, such as Betternet, if you want a VPN for Canada – there are many other great services to choose from. 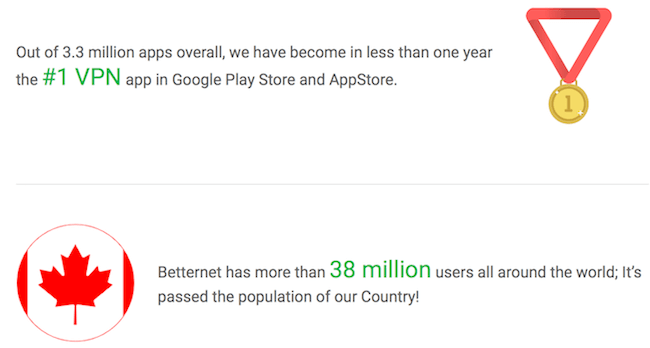 It’s very concerning that millions of people are trusting Betternet to protect their privacy and security. Betternet is another VPN service that offers a refund policy that appears to be good, but then has a ridiculously low bandwidth restriction. 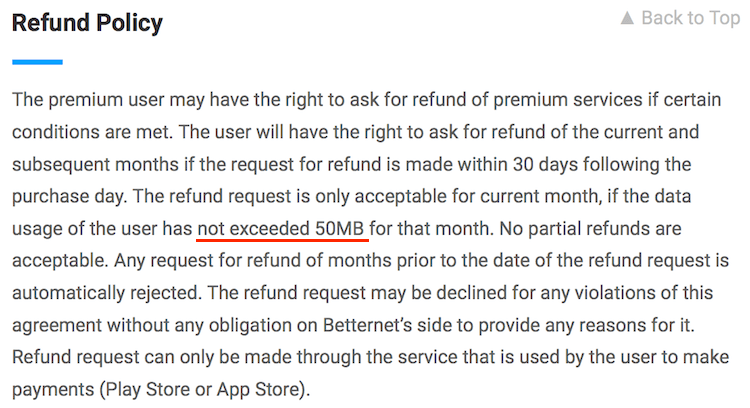 If you look carefully at the Terms, you’ll see that 50 MB of bandwidth usage will void the 30 day refund policy. You could easily exceed 50 MB in a few minutes with downloading files or just watching a few short YouTube videos, thereby voiding your refund window. One more question that comes to mind: how does Betternet know when someone exceeds 50 MB of bandwidth, when they claim to “not keep any data logs”? Obvious answer: because they maintain connection logs. 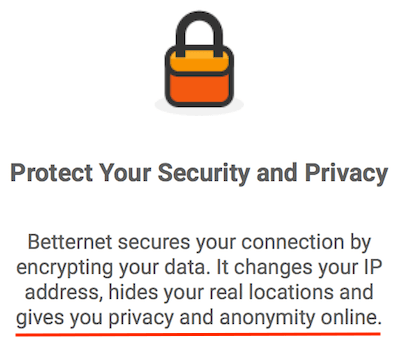 Betternet is another example of that shows the hidden dangers of free VPN services. 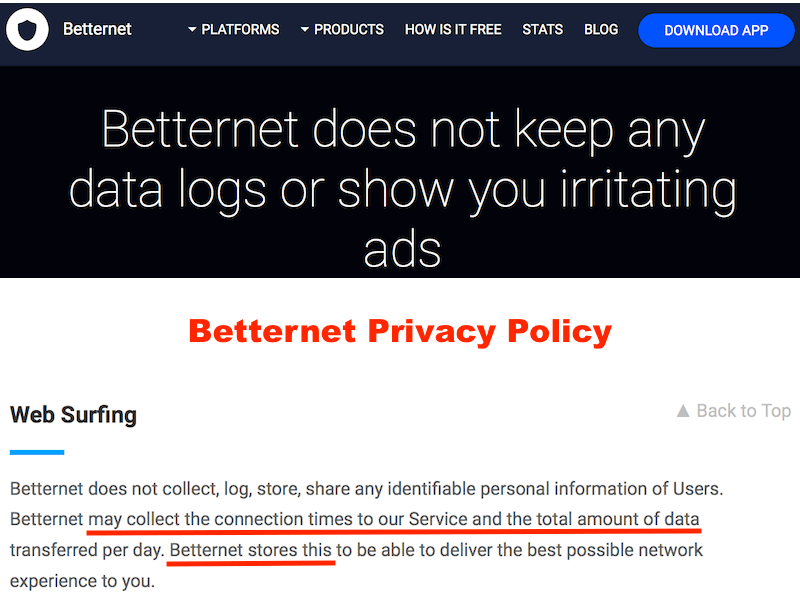 Given the testing results and research findings of this Betternet review, it would be a good idea to avoid Betternet’s VPN applications, in my humble opinion. Their premium VPN may offer more privacy and security than the free version, but it was not tested for this review. However given all these different problems, you may want to avoid all options. In addition to being secure and fast in my testing, the VPNs above are also located in a good jurisdiction for privacy. Canada, where Betternet is located, is a close partner with the United States in carrying out blanket mass surveillance. Due to all of the problems and privacy concerns found in this review, Betternet is not recommended by Restore Privacy. In general, free VPN services are usually a trap. They lure people in who are looking for a “good deal” and then utilize shady practices to make money off the user’s data. There are many better options available that will provide you with more security and privacy, as well as better speed and reliability. And if you are looking for deals, see the VPN coupons page. You can also check out the NordVPN coupon page as well as the ExpressVPN coupon page. To see the current top recommendations, check out the Best VPN report. Since November I’ve tried to cancel my subscription without any luck. Their so called customer support have never received my emails, how convinient and unlucky….. I started using free version of betternet a few days ago, and it worked fine on the first connection, which i left it running for 1 day or so. After disconnecting and reconnecting, i was unable to connect to the free servers after trying for 5 or so hours. I’m guessing they made it such that you would be tempted to purchase a plan from them to get it working again. DO NOT SIGN UP – Cannot cancel free trial on PC. They do not even have an unsubscribe option. Have sent multiple messages to customer service with no reply. Unfortunately they also scammed me with their free 7-day trial, which cannot be unsubscribed no matter what, so I have to contact my bank to get a solution for this. Avoid them like cancer.